This entry was posted in 2018 midterm elections, Donald Trump, Elections, fake news, Honduras-Guatemala 'caravan' invasion, illegal immigration, Liberals/Democrats/Left, Media, MSM, Trump Derangement Syndrome, United States, US Presidents and tagged #FakeNews, #thisisCNN, CNN, democrat propaganda machine, Jim Acosta, Sarah Huckabee Sanders. Bookmark the permalink. The Secret Service took away Acosta’s press credentials. HA HA HA HA! It appears that the MSM lost whatever was left of its collective mind yesterday. Long overdue. His constant rants and grandstanding was making it harder for legitimate journalists. You could actually see several of them squirm when he took the floor. No love lost with him. Let him cry, I noticed others didn’t actually jump on his wagon. Another happy ending story, keep them coming. Back in the day, my father would have clocked a punk like Acosta OUT—with one punch. 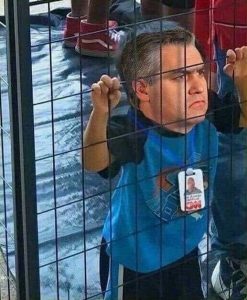 And Acosta deserved it, too. Jim Acosta is actually WORSE than Rachel Maddow or Rosie O’Donnell! As of today he is banned from the Whitehouse press corp. Ha, ha, ha, ha. Also, they cancelled Alec Baldwin’s show, ha, ha, ha, ha. And, in case that’s not enough, there’s this: Ruth Bader Ginsburg is in the hospital with three broken ribs. Somebody call a buzzard. It’s gonna be a fine day! If a deplorable had done that to WH staff with microphone there would be cuffs. I noticed the greatest thespian ever AKA Alec Baldwin didn’t get the perp walk and cuffs either. Some are more equal than others in the glorious man made utopia. So the Acoster is a spineless poosy that needs to be protected from a girl. If little lord Jimmy’s WH credentials are ever restored, he should have to undergo a rude and invasive strip search every time he enters the WH grounds. BTW: I think Jim the Acoster got himself booted on purpose.